In this section you will find the latest updates on lead, as well as the status of corrosion control. As water passes through service connections and within the plumbing of old homes, water can absorb lead from the solder, fixtures, and pipes. It is possible that this can increase the potential for lead exposure in drinking water. Samples are collected from homes that are most susceptible to lead contamination based on the infrastructure and age of their home (state and federal requirements). 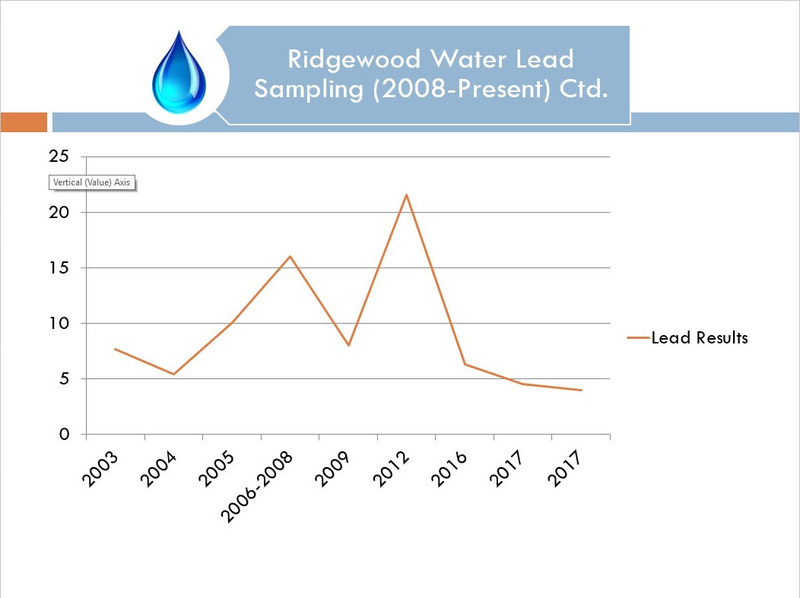 In 2012, lead samples resulted in levels that exceeded the federal and state action level of 15 parts per billion (ppb) which triggered RW to provide corrosion control treatment into the distribution system. Lead contamination can occur when water is in contact with plumbing materials containing lead for several hours undisturbed. Corrosion control is the treatment process in which small amounts of phosphates (approved by NJDEP and USEPA) are added to the water in order to prevent lead contamination. The phosphates create a thin coating on the inside of plumbing materials, effectively preventing the corrosion of lead into the water. This treatment has been fully implemented into the RW system since May, 2016 and has been very effective in lowering lead concentrations. Did RW Request Lead Sampling at Your Home? Discount water test kits are available from Ridgewood Water. Please call 201-670-5520 or visit Village Hall at 131 N. Maple Ave. Ridgewood, NJ 07450 for more information.